Other than issues with Windows store, one of the most common problem with Windows systems is with activation and licensing. Since piracy of the software is very common, Microsoft has made strict policies with the software it provides. Some of them prevent the installation until every security parameter is confirmed. 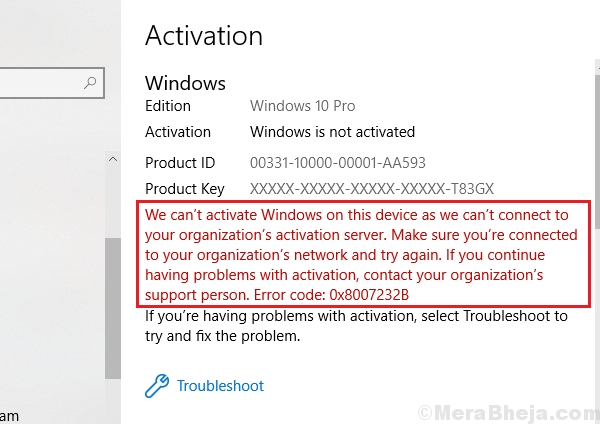 We can’t activate Windows on this device as we can’t connect to your organization’s activation server. Make sure that you’re connected to your organization’s network and try again. If you continue having problems with activation, contact your organization’s support person. Error code 0x8007007B. Windows provides licenses to companies who purchase the rights in bulk for multiple computers. This concept is called volume licensing. While it has its own benefits, the condition is that the system needs to be connected to the company’s network once in 180 days. This is to prevent the misuse of the licensing terms, particularly preventing unauthorised distribution of the licensed operating system to non-company individuals. However, employees who need to travel for work or work from remote locations might face the issue as well, since they might not be able to connect to the company’s network despite being genuine users. 1] Search for Command Prompt on Windows search and right-click the icon. Select Run as administrator. 3] If the value of the Product Key Channel says GVLK, the product was activated through Volume licensing. Step 2] Are you still a part of the organization? If the product was purchased through Volume licensing and you are not a part of the organization, you would have to buy a new license and/or a new copy of Windows 10. This is despite the fact that your license might not have expired yet, however, since the license came with a condition that does not exist now. Step 3] Was the error a mistake? If you faced this error despite being connected to your organization’s network, simply click on the Troubleshoot button to fix the problem. Restart the system once the troubleshooter does its job. Most probably, you would be facing this issue when you are at a remote location or at such a location that you cannot access your organization’s network. This is especially true when you are in a different city/country. In such a situation, you could contact one of Microsoft’s Volume licensing center and get your license activated. Here’s the list of Microsoft’s Volume licensing centers.